NY PRICING AT THE EXACT SAME TIME. 1307.00 ??? NOTICES FILINGS TODAY FOR APRIL CONTRACT MONTH: 444 NOTICE(S) FOR 44,400 OZ. As I expected, the criminal bankers tried their best to keep gold and silver from rising so as to pocket underwritten options. However they did not succeed in lowering the price of gold to $1300.00 and $17.25 silver where the bulk of options were underwritten. London based gold/silver options have an expiry tomorrow morning at around 10 -11 am. After that we should see our precious metals rise. In silver, the total open interest FELL BY AN APPRECIABLE 7235 contracts from 188,145 DOWN TO 182,823 DESPITE THE NO GAIN IN PRICE THAT SILVER UNDERTOOK WITH YESTERDAY’S TRADING (UP 0 CENTS).HOWEVER WHEN YOU COMPARE WITH THE INCREASE IN GOLD OI YOU CAN BE COMFORTED THAT THE BANKS ARE STILL QUITE RETICENT TO SUPPLY ANY PAPER. NO DOUBT THAT WE LOST SOME SEPT. COMEX SILVER LONGS TO SEPT. EFP’S (IN EXCESS OF 7300 EFP’S). HOWEVER THE CONTRACTION IN OPEN INTEREST IS CERTAINLY NOT AS GREAT AS GOLD ONCE WE HIT FIRST DAY NOTICE (OR THE DAY BEFORE) OF AN ACTIVE DELIVERY MONTH. AS SOON AS SILVER BROKE RESISTANCE AT $17.25 AND THUS THE NEW SUPPORT LEVEL, NEWBIE LONGS POURED ON THE JUICE WITH RECKLESS ABANDON AS THEY ENTERED THE SILVER ARENA. SEPT PLAYERS MOVED TO EFP’S BUT THE OBLIGATION TO DELIVER STILL RESTS WITH THEM BUT ON A DIFFERENT EXCHANGE (AND THEY RECEIVED A FIAT REWARD FOR THEIR EFFORT). THE LOSS IN OI TO EFP’S WAS GREATER THAN NEWBIE SPEC LONGS ENTERING THE SILVER ARENA. In ounces, the OI is still represented by just UNDER 1 BILLION oz i.e. 0.917 BILLION TO BE EXACT or 131% of annual global silver production (ex Russia & ex China). In gold, the open interest ROSE BY 1372 CONTRACTS WITH THE RISE in price of gold ($3.95 GAIN YESTERDAY). The new OI for the gold complex rests at 538,875. AS IN SILVER, THE GEOPOLITICAL LANDSCAPE WITH TRUMP THREATENING TO CLOSE GOVERNMENT IF HE DID NOT GET HIS WALL , THE DOVISH SPEECHES BY BOTH DRAGHI AND YELLEN ON FRIDAY AT JACKSON HOLE, THE HOUSTON FLOODING & NORTH KOREA FIRING MORE MISSILES CAUSED A HUGE NUMBER OF NEWBIE SPECS TO AGAIN ENTER THE GOLD ARENA WITH THE COMMERCIALS SUPPLYING THE NECESSARY PAPER LIKE DRUNKEN SAILORS. ONCE 1300 DOLLAR GOLD WAS PIERCED, MORE NEWBIE LONGS CAME EMBOLDENED CONTINUING THEIR QUEST OF TAKING ON THE BANKERS WHO RECIPROCATED IN KIND WITH THE PAPER. SOME OLD SPECS LEFT FOR A PROFIT WITH THE GOOD SIZED RISE IN PRICE. YESTERDAY AFTERNOON GOLD WAS HIT IN THE ACCESS MARKET TO WHICH IT RECOVERED BY 2 AM. THE BANKERS WHACKED AGAIN AND TRUE TO FORM GOLD RECOVERED IN PRICE AGAIN BY 7 AM TO WHICH ANOTHER RAID WAS INITIATED ALL TO CAUSE UNDERWRITTEN OPTION CONTRACTS TO EXPIRE WORTHLESS. THE BANKS ARE CROOKS AND RECEIVE HELP FROM OUR REGULATORS. Result: A FAIR SIZED GAIN IN OI WITH THE RISE IN PRICE IN GOLD AND RESISTANCE/NEW SUPPORT LEVELS HOLDING AT $1300 GOLD. we had: 444 notice(s) filed upon for 44,400 oz of gold. IN THE LAST 33 TRADING DAYS: GLD SHEDS 20.54 TONNES YET GOLD IS HIGHER BY $76.25 . 1. Today, we had the open interest in silver FELL BY 7235 contracts from 188,145 DOWN TO 182,823 (AND now A LITTLE FURTHER FROM THE NEW COMEX RECORD SET ON FRIDAY/APRIL 21/2017 AT 234,787) WITH YESTERDAY’S 0 CENT GAIN IN TRADING. SILVER RESPONDED TO 1) THE GEOPOLITICAL CLIMATE WHEREBY TRUMP THREATENED TO SHUT DOWN GOVERNMENT UNLESS HE GOT HIS WALL , 2) THE TWO DOVISH SPEECHES BY YELLEN 3) NORTH KOREA FIRING MORE MISSILES,4) THE HOUSTON FLOODING AND 5 THE PIERCING OF THE HUGE RESISTANCE LEVEL OF $17.25 WHICH NOW BECOMES THE NEW SUPPORT LEVEL. WE NO DOUBT HAD IN EXCESS OF 7300 LONG SEPT. SILVER PLAYERS TENDERING THEIR LONGS FOR SEPT. EFP’S (BUT THAT OBLIGATION STILL RESTS WITH THE BANKERS BUT ON A DIFFERENT EXCHANGE LONDON). NEWBIE LONGS ENTERED THE ARENA WHEN THEY SAW ANOTHER FAILED RAID ATTEMPT. HOWEVER THE GAIN IN NEWBIE LONGS WAS FAR LESS THAN THOSE PAPER PLAYERS EXITING FOR EFP’S. THE BANKERS CONTINUE TO BE RETICENT IN SUPPLYING THE SHORT PAPER. ANOTHER RAID WAS ORCHESTRATED TO CAUSE UNDERWRITTEN OPTIONS CONTRACTS TO EXPIRE WORTHLESS. RESULT: A LOWER OI AT THE COMEX, IN CONTRAST TO GOLD) WITH A ZERO PRICE INCREASE AND AN HUGE 7300+ GAIN IN SEPT EFP’S. ii)Freeport McMoRan has agreed to a compromise whereby they give up 51% of Grasberg by selling that portion to the Indonesian government. They still retain control over the operations of the mine. That ends years of wrangling by the crooked regime over there. i)Trump finally breaks his silence on North Korea by stating that talking is not the answer and that the USA is through with giving North Korea bribe money. the markets are still calm..
Hurricane Harvey makes second landfall on the border between Texas and Louisiana. Houston will probably receive one inch of rain as the hurricane dissipates. However apocalyptic flooding remains along with that record amount of 52 inches of rain in some parts of Texas. The total gold comex open interest ROSE BY A GOOD SIZED 1,372 CONTRACTS UP to an OI level of 538,875 WITH THE FAIR SIZED GAIN IN THE PRICE OF GOLD ($3.95 GAIN / YESTERDAY’S trading). This time the bankers did supply the necessary gold short paper when newbie longs took on our criminal bankers realizing that the geopolitical climate in the states was getting to their liking as Trump threatened to close government unless he got his wall plus the two dovish speeches by Yellen and Draghi at Jackson Hole, THE FLOODING OF HOUSTON , and the firing of those North Korean missiles. Once gold pierced the 1300 dollar resistance level, the bankers realized the trouble they were in but had no choice but to supply all the necessary comex paper short to satisfy the longs and then orchestrate a raid in the access market. Gold responded beautifully rising steadily up to 2 am in the morning whereupon another raid commenced. .The bankers were trying to make good on all of those underwritten options they took on. They looked for divine intervention this morning as they failed to get gold below$1300.00. The active August contract LOST 171 contract(s) to stand at 444 contracts. We had 179 notices filed YESTERDAY so we FINALLY GAINED 8 contracts or an additional 800 oz will stand at the comex and 0 EFP’s were issued in August which entitles the long holder to a fiat bonus plus a futures contract and most probably that would be a London based forward. The non active September contract month saw it’s OI LOSS OF 132 contracts DOWN to 1026. The next active contract month is Oct and here we saw a LOSS of 871 contracts DOWN to 50,276. The very big active December contract month saw it’s OI gain 2,342 contracts up to 420,043. LAST YEAR WE HAD A MONSTROUS 44.7 TONNES OF GOLD INITIALLY. BY THE CONCLUSION OF THE AUGUST 2016 CONTRACT MONTH 44.358 TONNES STOOD FOR DELIVERY. THIS YEAR, WE INITIALLY HAD 25.85 TONNES STANDING ON AUGUST 1/2017 AND WE WILL END UP WITH PROBABLY 16.33 TONNES. And now for the wild silver comex results. Total silver OI FELL BY 7235 CONTRACTS FROM 188,145 DOWN TO 182,823 WITH YESTERDAY’S 0 CENT GAIN IN PRICE. THESE REMAINING CONTRACTS ARE IN VERY STRONG HANDS AND NOTHING WILL CAUSE THEM TO LOSE ANY OF THEIR SILVER FROM THEIR SILVER TREE. SILVER RESPONDED TO THE GEOPOLITICAL CLIMATE WITH TRUMP THREATENING TO SHUT DOWN GOVERNMENT UNLESS HE GETS HIS WALL, THE TWO DOVISH SPEECHES BY YELLEN AND DRAGHI AT JACKSON HOLE, THE FLOODING OF HOUSTON AND THE FIRING OF THOSE NORTH KOREAN MISSILES. WE LOST IN EXCESS OF 7300+ CONTRACTS AS THESE PAPER PLAYERS TENDERED THEIR SEPT. LONGS FOR SEPT. EFP’S (BUT THAT OBLIGATION STILL RESTS WITH THE BANKERS BUT ON A DIFFERENT EXCHANGE LONDON). HOWEVER ONCE THE HUGE RESISTANCE LEVEL OF $17.25 HELD, NEWBIE LONGS BECAME EMBOLDENED TO TAKE ON THE BANKERS. THE BANKERS ARE LOATHE TO SUPPLY NEW SILVER SHORT PAPER. SOME OLD SPECS EXITED WITH PROFITS FROM A HIGHER PRICE. ANOTHER RAID WAS ORCHESTRATED TO CAUSE UNDERWRITTEN OPTION CONTRACTS TO EXPIRE WORTHLESS. RESULT: A GOOD SIZED DECREASE IN OI AT THE COMEX WITH A ZERO GAIN IN PRICE (IN TOTAL CONTRAST TO GOLD). WE HAD A GOOD SIZED TRANSFER OF LONGS FOR ANOTHER PHYSICAL DELIVERY PRODUCT, EFP’S ,WHEREBY THEY RECEIVE A FINANCIAL REWARD PLUS A DELIVERABLE PRODUCT IN LONDON. We are now in the next big non active silver contract month of August and here the OI LOST 1 contract DOWN TO 0. We had 1 notice(s) filed yesterday. Thus we GAINED 0 contract(s) or an additional NIL oz will stand for delivery in this non active month of August and AGAIN zero EFP’s were issued for the August contract month. Please note that in gold we continually see EFP’s issued throughout the delivery month but not in silver!! HOWEVER WE DID HAVE A GOOD SIZED NUMBER OF SILVER LONGS IN SEPTEMBER RECEIVE EFP’S IN EXCHANGE FOR THEIR DEPARTED LONG POSITIONS. THESE GUYS RECEIVE A FIAT BONUS PLUS A DELIVERABLE PRODUCT ON ANOTHER EXCHANGE. The next active contract month is September (and the last active month until December) saw it’s OI fall by 14,659 contacts down to 14,125. The next non active contract month for silver after September is October and here the OI GAINED 31 contacts UP TO 873. After October, the big active contract month is December and here the OI GAINED by 7,116 contracts UP to 151,651 contracts. Today, 0 notice(s) were issued from JPMorgan dealer account and 27 notices were issued from their client or customer account. The total of all issuance by all participants equates to 444 contract(s) of which 0 notices were stopped (received) by j.P. Morgan dealer and 0 notice(s) was (were) stopped/ Received) by j.P.Morgan customer account. To calculate the initial total number of gold ounces standing for the AUGUST. contract month, we take the total number of notices filed so far for the month (5245) x 100 oz or 524,500 oz, to which we add the difference between the open interest for the front month of AUGUST (444 contracts) minus the number of notices served upon today (444) x 100 oz per contract equals 524,500 oz, the number of ounces standing in this active month of AUGUST. we GAINED 8 contracts or an additional 800 oz will stand for delivery and 0 EFP’s for August were issued. Over a year ago the comex had 303 tonnes of total gold. Today the total inventory rests at 270.48 tonnes for a loss of 33 tonnes over that period. Since August 8/2016 we have lost 84 tonnes leaving the comex. However I am including kilobar transactions and they are very suspect at best. IN THE LAST 12 MONTHS 84 NET TONNES HAS LEFT THE COMEX. i) from Scotia: 56,078.960 was removed from the customer account as a counting error. The total number of notices filed today for the AUGUST. contract month is represented by 1 contract(s) for 5,000 oz. To calculate the number of silver ounces that will stand for delivery in AUGUST., we take the total number of notices filed for the month so far at 1249 x 5,000 oz = 6,245,000 oz to which we add the difference between the open interest for the front month of AUGUST (1) and the number of notices served upon today (1) x 5000 oz equals the number of ounces standing. Thus the FINAL standings for silver for the AUGUST contract month: 1249 (notices served so far)x 5000 oz + OI for front month of AUGUST(1 ) -number of notices served upon today (1)x 5000 oz equals 6,245,000 oz of silver standing for the AUGUST contract month. This is extremely high for a non active delivery month. Silver is being constantly demanded at the silver comex and we witness again the amount of silver increases daily right from the get go. We GAINED 0 contracts or an additional NIL oz wishes to stand for delivery in this non active month of August and 0 EFP’s were issued for the silver August month. We may have had a tiny number of Sept EFP’s issued. At this point in the delivery cycle last year on August 29/2016 we had 10,613 contracts standing vs this yr at 14,125. WE HAVE ONE MORE READING DAY BEFORE FIRST DAY NOTICE TOMORROW. JUDGING FROM WHAT WE HAVE BEEN EXPERIENCING IN SILVER, THIS WEEK’S FIRST DAY STANDING WILL BE A DILLY!! Last yr on the first day notice for the Sept silver 2016 contract we had 17.070 million oz stand for delivery. FRIDAY’S CONFIRMED VOLUME OF 202,259 CONTRACTS WHICH EQUATES TO 1,011 MILLION OZ OF SILVER OR 144% OF ANNUAL GLOBAL PRODUCTION OF SILVER EX CHINA EX RUSSIA). IN OUR HEARINGS THE COMMISSIONERS STRESSED THAT THE OPEN INTEREST SHOULD BE AROUND 3% OF THE MARKET. 1. Central Fund of Canada: traded at Negative 6.2 percent to NAV usa funds and Negative 6.2% to NAV for Cdn funds!!!! Note: Sprott silver trust back into NEGATIVE territory at -0.55%/Sprott physical gold trust is back into NEGATIVE/ territory at -0.60%/Central fund of Canada’s is still in jail but being rescued by Sprott. *LAST 160 TRADING DAYS: A NET 23.98 TONNES HAVE NOW BEEN ADDED INTO GLD INVENTORY. *FROM FEB 1/2017: A NET 7.17 TONNES HAVE BEEN ADDED. A new monetary standard which will see the dollar “reboot” and gold be revalued to $10,000/oz according to best-selling author and Pentagon insider Jim Rickards. Articles about an imminent return to the gold standard are not exactly infrequent in the gold world and it can be easy to become immune to them and dismiss them without considering the facts and case being made. Many of the articles are not just based one ever-wishful daydreams. Much of it comes from information that is true about today and is then applied to situations that we have seen in the past. Rickards makes this point himself. A monetary reset is not unheard of. Since the Genoa Accord in 1922 there have been a further eight reboots. The most recent was in 2016 in what Rickards refers to as the Shanghai Accord which purportedly saw deals done that would allow China to ease without leading to a sharp correction in the US stock market. Stratfor’s analysis was considering the threat of a strong dollar on Trump’s plans to reduce the trade deficit. We have recently discussed the danger of political deadlock and uncertainty on the US Dollar and how this will benefit gold. Rickards’ comments come from a similar viewpoint in that there is decreasing faith in the US dollar. This lack of trust is mainly driven by the more than $100 trillion debt ($20 trillion national debt and another $100 trillion in off ‘balance sheet’ liabilities) in the country and the ongoing dedollarisation by major economies. Should Trump continue to stumble, disappoint and provoke then we will no doubt see this issue snowball even faster. The Federal Reserve — America’s central bank — has lowered interest rates and printed nearly 4 trillion new dollars out of thin air since the economic crisis in 2008. That’s equivalent to nearly one quarter the size of the entire U.S. economy. That’s over three times as big as the entire U.S. economy. If you add the federal debt to that number, you get $80 trillion! That’s more than four times the size of the U.S. economy. 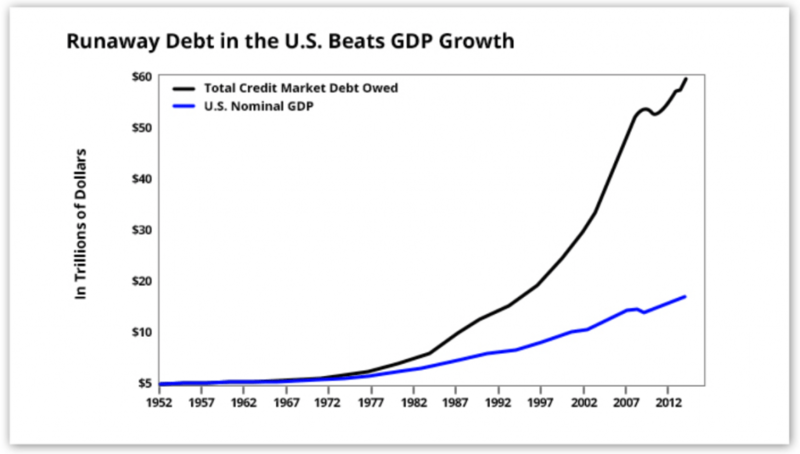 All of this is the result of too much debt… too many Obama policies… and too much meddling by the Federal Reserve. And he’s right. 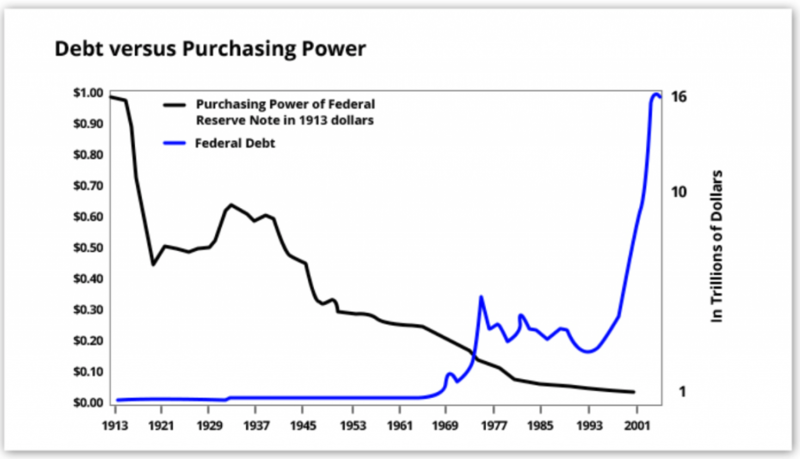 The U.S. dollar has lost 96% of its value since the Federal Reserve was created in 1913. Meanwhile the national debt has skyrocketed! That’s why many countries are relentlessly abandoning the dollar. Typically most foreign governments invest their surplus or savings in U.S. financial assets. Global trade is typically conducted in U.S. dollars, too. But all of that is about to change if the dollar is not rebooted. The dollar is getting dumped around the globe because of our debt, spending and money printing. But it’s not just the “de-dollarization” of the world that’s making this so urgent. You see, countries have not only stopped buying U.S. Treasuries… but they’re selling them at a record clip. Rickards believes that the situation of dedollarization will get so bad that the US President will be forced to call a summit of world leaders and monetary authorities. Then, they’ll agree to simultaneously revalue all of their currencies against gold until the price reached $10,000 per ounce. Will Trump really call a global summit? Who knows. His own team probably won’t know until he tweets about it. But you should consider one element that Rickards mentions. Aside from a new monetary order, Trump is about to become the most powerful US president when it comes to looking after the US Dollar. You see, there are seven total seats on the Board of Governors of the Federal Reserve. That’s the group that makes our central bank’s decisions. The president appoints each governor. That means Trump could be able to appoint five governors in the coming months, including a chair and two vice chairs. Trump will have six out of seven board seats in Republican hands. In effect, Trump will own the Fed! Conservatives will soon be a majority on the Supreme Court, too. And there are more Republican state legislatures and governors in the state mansions than at any time since Civil War reconstruction. This means President Trump could have zero resistance to changing the debt-dollar system we have. Whether Trump ‘owning’ the Fed means he would seek to upend the international monetary order is one thing. But, even if he doesn’t do that, investors would be wise to consider what impact a Trump-controlled Federal Reserve would have on the world. It’s the gold price Donald Trump will need to use to “reboot” the U.S. dollar and the world’s international monetary system. Since the world financial crisis in 2008, many of the world’s governments have been buying physical gold in record amounts. In fact, according to a recent report by the Official Monetary and Financial Institutions Forum (OMFIF), world central banks have been buying gold at a rate of 385 tons per year since the 2008 crisis. Those are levels last seen when the world was on the gold standard pre-1971. Why are they buying so much gold? And the more gold they own, the more leverage they’ll have when Trump calls the world’s financial powers together to reform the monetary system at his Mar-a-Lago resort. As with chat surrounding soon-to-be gold standard, calls for $10,000/oz gold (or more) are also not uncommon in precious metal spheres. Since I began in the gold industry I have been reading about the imminent rise of the gold price to $30,000 even $40,000. In truth, I believe such outlandish predictions are damaging for the long-term reputation of the gold and silver investment community. Regardless of where you think the gold price and gold standard could head to, it is all relative to your own situation, your own portfolio and the currencies you buy it in. At the same time, while gold at $10,000 per ounce seems outlandish now, it is not impossible and indeed the scale of the levels of debt in the U.S. and internationally make it quite possible. When gold was trading at $250/oz in 2002, a rise of more than seven times and gold at $1,900 seemed outlandish to most. Whether or not you believe Trump will ever achieve a new gold standard in a currency reset, it is vital to consider the point that central banks have been net buyers of gold for some time. A lesson for all investors. And the most important nugget to takeaway from pieces such as this is that governments are in a completely unsustainable, debt-laden position. The current state of the global economy is unprecedented. We are also in unknown times when it comes to technology, cyber threats and nuclear sabre rattling. 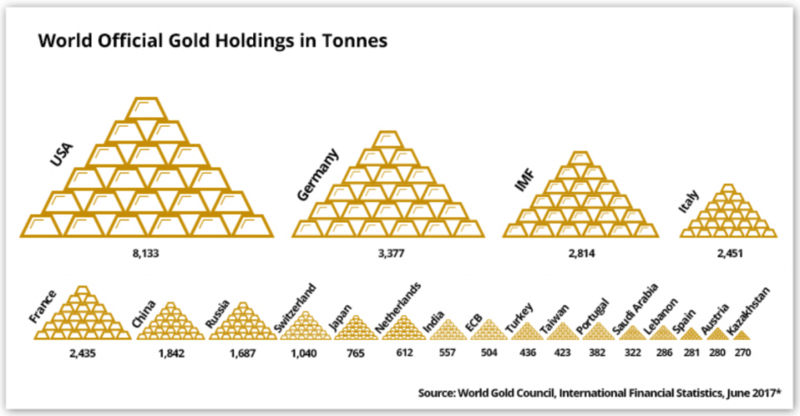 Governments buying gold is sensible portfolio diversification. Rickards, Stratfor and even us here at GoldCore cannot predict what will happen in terms of the gold price. What we do know is that gold has played a very important role throughout history – especially as a hedge against currency devaluation. Currency devaluations are coming and currencies are set to fall in value against gold as they have done throughout history. The only question is how much fiat currencies will fall versus gold and silver. History has taught us that governments rarely know what they are doing when it comes to financial and monetary planning. It has also taught us that when times are tough countries turn on one another and war becomes common. Trade wars lead to currency wars lead to real wars. We are seeing that today. Investors and savers are wise to think small. They should consider their own form of gold standard and how they can protect themselves. 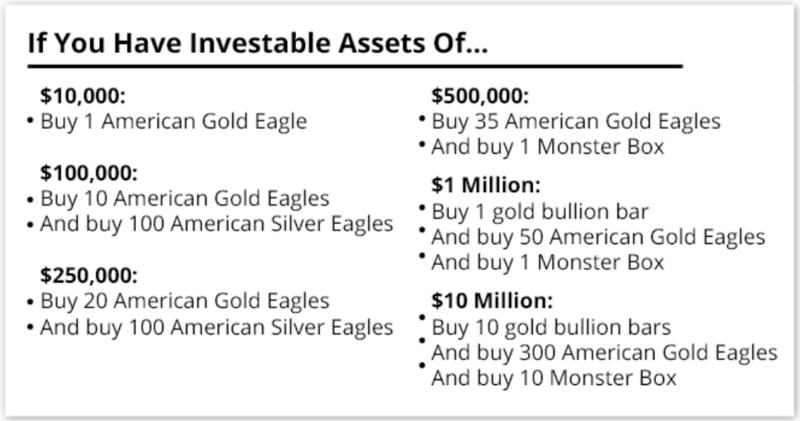 Buying gold bars, gold eagles and silver eagles including monster boxes is a prudent way to hedge the real risk of global currency debasement today. The extracts are taken from an article which originally appeared on Agora Financial. Gold eagles can currently be acquired from GoldCore at record low premiums of 3%. Please call to secure coins as this is a phone call offer only and not available online. Freeport McMoRan has agreed to a compromise whereby they give up 51% of Grasberg by selling that portion to the Indonesian government. They still retain control over the operations of the mine. That ends years of wrangling by the crooked regime over there. JAKARTA, Indonesia — Indonesia has reached a deal to let Freeport-McMoRan Inc. keep operating its giant Grasberg copper mine, after the U.S. company agreed to sell a majority stake to the government following years of wrangling. Freeport said today it had made a “major concession and compromise” in agreeing to sell a 51 percent stake and to build a second smelter in Indonesia. The company said the deal would be structured in a way that Freeport would retain control over the operations and governance of its Indonesian business. Fund manager and author Jim Rickards writes today that repatriation of German gold from the New York Fed to the Bundesbank’s vault in Frankfurt will greatly reduce the gold available for market manipulation through leasing, because there is no well-developed system of leasing in Frankfurt nor adequate law to provide for it. Rickards adds that the repatriation was hastened so that German Chancellor Angela Merkel, embroiled in an election campaign, could appease a small nationalist party that advocates gold repatriation if she needs to form a coalition government. Presumably that party is Alternative for Germany, which has nominated GATA’s friend Peter Boehringer, founder of the Repatriate Our Gold campaign, for Germany’s parliament, the Bundestag. Rickards also writes today that Treasury Secretary Steven Mnuchin’s surprise visit to Fort Knox last week may have been preparation for plans to revalue the U.S. gold reserve to market prices in case Congress fails to raise the U.S. debt ceiling. A higher book value for the reserve, Rickards writes, would enable the Treasury Department to issue new gold certificates to the Federal Reserve in exchange for billions of dollars in cash. All this is at best informed speculation but it’s an important reminder that, as GATA long has maintained, gold is the secret knowledge of the financial universe and that governments feel compelled to conceal that knowledge from the public and the markets at all costs. Last week featured two unusual stories on gold – one strange and the other truly weird. These stories explain why gold is not just money but is the most politicized form of money. They show that while politicians publicly disparage gold, they quietly pay close attention to it. The Deutsche Bundesbank, the central bank of Germany, announced that it had completed the repatriation of gold to Frankfurt from foreign vaults. The German story is the completion of a process that began in 2013. That’s when the Deutsche Bundesbank first requested a return of some of the German gold from vaults in Paris, in London and at the Federal Reserve Bank of New York. Those gold transfers have now been completed. This is a topic I first raised in the introduction to Currency Wars in 2011. I suggested that in extremis, the U.S. might freeze or confiscate foreign gold stored on U.S. soil using powers under the International Emergency Economic Powers Act, the Trading With the Enemy Act or the USA Patriot Act. This then became a political issue in Europe with agitation for repatriation in the Netherlands, Germany and Austria. Europeans wanted to get gold out of the U.S. and safely back to their own national vaults. The German transfer was completed ahead of schedule; the original completion date was 2020. But the German central bank does not actually want the gold back because there is no well-developed gold-leasing market in Frankfurt and no experience leasing gold under German law. German gold in New York or London was available for leasing under New York or U.K. law as part of global price-manipulation schemes. Moving gold to Frankfurt reduces the floating supply available for leasing, making it more difficult to keep the manipulation going. Why did Germany do it? The driving force both in 2013 (date of announcement) and 2017 (date of completion) is that both years are election years in Germany. Angela Merkel’s position as chancellor of Germany is up for a vote on Sept. 24, 2017. She may need a coalition to stay in power, and there’s a small nationalist party in Germany that agitates for gold repatriation. Merkel stage-managed this gold repatriation with the Deutsche Bundesbank both in 2013 and this week to appease that small nationalist party and keep them in the coalition. That’s why the repatriation was completed three years early. She needs the votes now. Secretary of the Treasury Steve Mnuchin and Senate Majority Leader Mitch McConnell just paid a visit to Fort Knox to see the U.S. gold supply. Mnuchin is only the third Treasury secretary in history ever to visit Fort Knox and this was the first official visit from Washington, D.C., since 1974. The U.S. government likes to ignore gold and not draw attention to it. Official visits to Fort Knox give gold some monetary credence that central banks would prefer it does not have. Why an impromptu visit by Mnuchin and McConnell? Why now? The answer may lie in the fact that the Treasury is running out of cash and could be broke by Sept. 29 if Congress does not increase the debt ceiling by then. Once the Treasury revalues the gold, the Treasury can issue new “gold certificates” to the Fed and demand newly printed money in the Treasury’s account under the Gold Reserve Act of 1934. Since this money comes from gold revaluation, it does not increase the national debt and no debt ceiling legislation is required. This would be a way around the debt ceiling if Congress cannot increase it in a timely way. This weird gold trick was actually done by the Eisenhower administration in 1953. Maybe Mnuchin and McConnell just wanted to make sure the gold was there before they revalue it and issue new certificates. Whatever the reason, this much official attention to gold is just one more psychological lift to the price along with Fed ease, scarce supply and continued voracious buying by Russia and China. 3b Japan 10 year bond yield: RISES TO +.011%/ GOVERNMENT INTERVENTION !!!! (Japan buying 100% of bond issuance)/Japanese yen vs usa cross now at 114.34/ THIS IS TROUBLESOME AS BANK OF JAPAN IS RUNNING OUT OF BONDS TO BUY./JAPAN 10 YR YIELD FINALLY IN THE POSITIVE/BANK OF JAPAN LOSING CONTROL OF THEIR YIELD CURVE AS THEY PURCHASE ALL BONDS TO GET TO ZERO RATE!! 3j Greek 10 year bond yield FALLS to : 5.540??? 30 SNB (Swiss National Bank) still intervening again in the markets driving down the SF. It is not working: USA/SF this morning 0.9569 as the Swiss Franc is still rising against most currencies. Euro vs SF is 1.1431 well above the floor set by the Swiss Finance Minister. Thomas Jordan, chief of the Swiss National Bank continues to purchase euros trying to lower value of the Swiss Franc. S&P futures are higher in early Wednesday trading, alongside Asian stocks and European bourses, both solidly in the green as the EURUSD drifts below the 1.20 “redline” while the dollar rebounds off a two and a half year low following the US “measured” response to North Korea’s missile test, which soothed jittery investors who now turn their focus to US economic data. Equity indexes in Japan, Hong Kong and South Korea also rose while 10Y US Treasuries are steady before the release of ADP employment and GDP data, both of which are expected to show an increase. The VIX is down fractionally to 11.60. European stocks rose higher, tracking counterparts in Asia and the United States and reversing losses from the day before when investors were spooked by Pyongyang’s firing of a ballistic missile over Japan. Fears that this could trigger an aggressive response receded on Wednesday after the United Nations – in a statement drafted by the United States – condemned North Korea’s latest missile launch but held back any threat of new sanctions. Trump, who previously vowed not to let North Korea develop nuclear missiles that can hit the mainland United States, said the world had received North Korea’s latest message “loud and clear”. “Instead of the (U.S.) President responding to the escalation via Twitter, as has happened on many recent occasions, the White House issued an official statement to condemn the action,” said IronFX analyst Charalambos Pissouros. “This may have been interpreted by investors as a sign that the US will approach the situation in a more measured and diplomatic manner, as opposed to raining down ’fire and fury’.” North Korean media reports on the launch also lacked their usual claims of technical advances, indicating the test may not have succeeded as planned. Boosted by this optimism from Trump’s response, European markets rebounded after yesterday’s U.S.-led unwind of the North Korea related risk-off move. DXY holds at overnight strongest levels; AUD marginally outperforms after solid construction data; USD/JPY briefly traded above 110.00 through the European open which also provides a lift to U.S. equity futures. In Europe, the pan-European STOXX 600 gained 0.5%, recovering nearly all the ground lost in the previous session and banking stocks – which had led the risk-averse move lower on Tuesday – were up nearly 1 percent, while the utilities sector lags after France warns on eventual closure of nuclear plants. European strength emerged after the stronger dollar pushed the EURUSD off the 1.20 ledg, trading below 1.950 last. The U.K.’s FTSE 100 Index increased 0.2%. Germany’s DAX Index rose 0.4 percent, the largest advance in more than a week. European upside followed gains in Asia, where MSCI’s broadest index of Asia-Pacific shares outside Japan rose 0.6% while Japan’s Nikkei rose 0.7%. The Hang Seng Index rose 1.2%, closing above 28,000 for the first time in two years as concern over North Korea tensions waned and China Shenhua Energy led power producers higher, while banks rose ahead of earnings results. The Shanghai Composite Index fluctuated before edging lower. The MSCI Asia Pacific Index rose 0.2 percent. Meanwhile, Bund futures edged higher as German regional CPIs indicated a national reading broadly in-line with consensus, German and U.K. curves slightly steeper. Euro zone government bond yields, which fell to fresh lows on Tuesday, edged up on Wednesday as forecast-beating inflation in Spain was expected to be followed by similar data in Germany, defying the euro’s recent strength. The yield on 10-year Treasuries climbed less than one basis point to 2.13%. Germany’s 10-year Bunds increased one basis point to 0.35%, while Britain’s 10-year yield gained two basis points to 1.019%, the largest advance in more than a week. In commodities, gasoline hit a two-year high, rallying another 2.8%, after Hurricane Harvey shut down nearly a fifth of U.S refining capacity, and more closures are expected. However, the rising crude inventories as a result of refinery shutdowns, weighed on oil prices. U.S. crude futures fell 0.6 percent to $46.17 a barrel, after touching a five-week low on Tuesday. Brent slipped 0.6 percent to $51.67. Spot gold edged marginally lower to $1,309.39 an ounce on Wednesday. On Tuesday, the precious metal jumped to its highest since Trump was elected U.S. president. Economic data include second print on GDP growth, weekly MBA mortgage applications and August ADP employment. Analog Devices Inc. and Workday Inc. are among companies reporting earnings. underpinned as the USD/JPY-risk relationship took full effect and with better than expected Retail Sales adding to the optimism. lower amid flows into riskier assets, while a lukewarm BoJ Rinban announcement also failed to spur demand. sectors (with the exception of utilities) trading in positive territory. Jitters regarding North Korea are somewhat dissipating slightly. slight improvement in risk sentiment, next resistance in the pair resides around 110.35-40.
and a half year high at 1.2070.
relatively strong data in the form of building and construction data, while gains against the JPY and NZD further underpinned AUD. AUD/NZD briefly broke above 1.10 before running into resistance at the YTD high of 1.1020.
from some of the recent sharp gains. Libya’s NOC says 360kbpd of crude production shutdown by pipeline blockades that have closed 3 fields. US API weekly crude stocks (21 Aug, w/e) -5780K (Prev. -3595K). Valero Port Arthur refinery is shutting large crude unit and gasoline unit, due to Harvey. Motiva states that although weather conditions continue to deteriorate, Port Arthur refinery remains stable at 40% of capacity. Looking at the day ahead, US’s ADP employment change for August (185k expected) will be worth watching in the context of Friday’s payrolls while the second readings for 2Q GDP (2.7% expected) and core PCE are due. Away from the data, the Fed’s Powell will speak today. With geopolitics back in the spotlight and markets somewhat treading on eggshells again the most eye-catching move for us yesterday was seeing Treasury yields dart back below their pre-Sintra levels. Indeed at one stage 10y Treasuries touched as low as 2.084% yesterday morning before ending last night a bit higher at 2.129%. On an intraday basis the low for the year had been 2.101% back in the middle of June before the coordinated hawkish message in Portugal later that month. 10y Bunds (-3.4bps to 0.338%) are now also less than 10bps away from their pre-Sintra levels after topping out at 0.597% just over a month ago. Benchmark OATs are also within 6bps of their YTD lows while bond markets in the Netherlands and the UK are also near their lows. A decent run for DM bond markets then which is noticeable when you consider that global growth signals (recent PMIs) have been robust, commodity prices ex oil are either at or around YTD highs for the most part and the expectation is still that the ECB is likely to signal a tapering this autumn and the Fed might still hike again in December (albeit with market pricing down to just 30% based on Bloomberg’s calculator). All these factors have been put to one side however as politics has taken center stage through the northern hemisphere summer. Concerns firstly about President Trump’s political agenda and more recently the debt ceiling and now the latest North Korea developments have certainly all played a role in the recent moves. Regarding the latter, the response by President Trump yesterday to North Korea firing a missile over Japan was to say that “all options are on the table” for a response while North Korea’s Kim Jong Un has said overnight that the missile test was a “meaningful prelude to containing Guam” according to North Korean state media. The response from markets meanwhile has actually been more of a tale of two halves. The initial reaction was to see safe havens rally and European equities selloff. Indeed the Stoxx 600 ended -1.04% although in fairness that wasn’t helped by another strong session for the Euro which smashed through 1.200 versus the Dollar before softening a bit into the evening to close at 1.1972 (-0.06%). After the S&P 500 initially opened -0.66% the tone swiftly reversed with the view that the response from world leaders was fairly measured and further escalation was unlikely. The S&P closed +0.08% by the end of play with losses for banks and Best Buy (-12% post results) offset by gains from the industrials and tech sectors. The VIX, which topped out at 14.34 intraday and the highest in over a week, finished up ‘just’ +3.36% at 11.70 and well below the two peaks of earlier this month (15.55 and 15.51). Other safe havens yesterday pared gains with Gold down -0.07% after being up +1.20% and the Swiss Franc +0.05% after being up +1.32%. This morning in Asia markets have broadly followed the US lead and are trading higher, with the Kospi (+0.08%), Nikkei (+0.58%) and Hang Seng (+0.75%) all firmer, while only the ASX 200 (-0.20%) is struggling for traction. The Korean Won is also +0.40% this morning while US equity futures are pointing towards a positive start. The other notable mover is US gasoline prices which having rallied over +4% yesterday are up another +3.21% this morning in the wake of Tropical Storm Harvey. Moving on. One thing worth highlighting this morning is a Politico story which ran last night suggesting that Trump will today launch a “major push for a sweeping tax overhaul” at a speech in Missouri. The article suggests that the speech is to be focused on the US corporate system and making it more competitive on a global scale, as well as wiping out deductions that benefit higher-income tax payers. So we’ll see what that has in store. Jumping to the latest on Brexit now where there are only two more rounds of talks penciled in before an EU summit and things do not appear to be going smoothly based on the reports that have emerged. The UK has reportedly asked for more negotiating time with the EU to pick up the pace, but the EU first wants to settle the terms of the split, particularly the financial settlement and seems happy to shift to more talks in December. To put it into context, European Commission President Juncker said “I’ve read all (UK government’s) position papers and none of them is satisfactory”. A spokesman for UK PM Theresa May said “we believe we’re in a good position and we would like to move on to discuss our future relationship”. Staying in Europe, German Chancellor Angela Merkel spoke at her annual summer press conference and covered a range of topics. On the rising Euro, Merkel highlighted that it is almost certain to have an impact on exports, but the trade surplus is the result of solid demand for German products and “does not view the trade surplus as so dramatic”. Elsewhere, Merkel noted that she “doesn’t have anything against the concept of an EU finance minister”, but “you just have to work out what he/she could do and we’re not at that point yet in our talks with France”. Across the pond the Treasury’s four week $25bn bill sale went smoothly yesterday at a yield of 0.960% and achieved the highest bid-to-cover ratio since the 7th March auction. The notes mature just before the US potentially facing a funding shortfall if the debt ceiling was not raised. Wrapping up yesterday’s macro data in the US which was largely in-line to slightly firmer than expected. The August Conference Board consumer confidence index was up 2.9pts to 122.9 (vs 120.7), which is the highest reading since December 2000 (excluding March this year) and could have been stronger if factoring in the small downward revision to the prior reading. Elsewhere, the June Case-Shiller house price index was broadly in line at 0.11% mom (vs 0.10% expected) and 5.65% yoy (vs 5.60% expected). Over inFrance, 2Q GDP was in line at 0.5% qoq, but revisions nudged the annual growth rate down slightly to 1.7% yoy (vs 1.8%). Consumer spending for July was in line at 0.7% mom, lifting the annual growth rate to 2.1% yoy (vs 1.8%), which is the highest reading for this year. InGermany, the consumer confidence index was slightly ahead of expectations at 10.9 (vs 10.8), which marks a fresh 16-year high. In the UK, the August Nationwide house price index was slightly lower than expected at -0.1% mom (vs 0% expected) and 2.1% yoy (vs 2.5%). Before we look at the day ahead, a quick mention that on credit derivatives, Michal in our team published a report “iTraxx Main: Buy the 3s5s10s Fly” yesterday. He fleshes out his latest views on CDS index curves and provides a detailed analysis of the trade, including recent regulatory developments that should support its performance. You should find the note in your inbox or email Michal.Jezek@db.com for a copy if not. Looking at the day ahead,Germany’s preliminary inflation readings for August (0.1% mom and 1.8% yoy expected) and Italy’s July PPI data are due. In the UK, the July mortgage approvals and data on money supply as well as net credit lending are also due. Elsewhere, the Eurozone’s August confidence indicators for business, consumer and the economy are also due. Across the pond, US’s ADP employment change for August (185k expected) will be worth watching in the context of Friday’s payrolls while the second readings for 2Q GDP (2.7% expected) and core PCE are due. Away from the data, the Fed’s Powell will speak today. As Snake Hole Lounge details, the latest addition is the island of Cyprus whose Bank of Cyprus just posted a huge loss on bad debt provisions. (Bloomberg) — Bank of Cyprus reported loss for the second quarter of EU556 million. I guess ECB’s Mario Draghi will keep the pedal to the metal! I wonder if Queen’s Freddie Mercury foresaw Cyprus’ banking fiasco? Here is the ECB’s Mario Draghi telling Cyprus that they have potential for a healthy banking system and positive 2 year sovereign yields. Front-month (Sept) RBOB Gasoline futures traded as high as $1.90 this morning – the highest since July 2015 – as more refiners (including America’s largest) shutdown output due to Harvey’s impact. As Bloomberg reports, America’s largest oil refinery is joining the spate of shut-downs in the face of Tropical Storm Harvey’s apocalyptic rains, potentially reducing U.S. fuel-making capacity to the lowest level since 2008. Motiva Enterprises LLC’s Port Arthur facility, the largest in the U.S., is shutting because of severe flooding issues,according to a person with knowledge of the plant’s operations who didn’t want to be identified because the information isn’t public. Motiva, owned by Saudi Arabia’s national oil company, said in a statement that the plant was operating at about 40 percent of its 605,000-barrel-a-day capacity. It joins more than a dozen other plants in Texas with combined capacity of more than 4 million barrels a day that have gone at least partially offline since Harvey approached the coast late last week. That amount of offline capacity could reduce U.S. fuel production to the lowest since Hurricane Ike shut several refineries after striking the Texas coast in 2008. While Gasoline futures have jumped to the highest in more than two years, the fuel’s premium to crude oil has risen to a 16-month high. “These closures are already impacting markets with crude prices lower on a perceived drop in demand and gasoline prices spiking in response to lower supply,” Sandy Fielden, director of oil and products for Morningstar Commodities Research, said in an emailed note. Even as plants recover, the restarts will be delayed by distribution issues and crude supply, compounded by port closures cutting off imports, Fielden said. The Port of Houston has no timeline for reopening, while Corpus Christi’s port is expected to resume normal operations by Sept. 4. The National Hurricane Center (NHC) will be initiating advisories at 11 AM AST, as the new area of low pressure in the eastern Atlantic Ocean will develop into Tropical Storm Irma. Tropical Storm Irma will become the 9th storm of the 2017 Atlantic hurricane season as it moves towards the Gulf of Mexico region. NHC will be initiating advisories at 11 AM AST on Tropical Storm Irma, located west of the Cabo Verde Islands. In the near-term, future Irma will bring locally heavy rain and gusty winds to the Cabo Verde Islands through Wednesday. South Florida Weather Management District (SFWMD) reports various pathways for Irma. National Weather Service (NHS) reports Global Tropics Hazards and Benefits Outlook for the next 1-2 weeks. First week, Irma is labeled as a ‘tropical cyclone formation’ heading towards Caribbean Sea and the Gulf of Mexico. Second week, passing inland and over Central America. “There is the potential to ramp up to a powerful hurricane in the coming days,” according to AccuWeather Hurricane Expert Dan Kottlowski. Irma will take about a week for the system to make its trek westward across the Atlantic Ocean. Meteorologists will likely be tracking this storm through the middle of September. “All interests in the eastern Caribbean will need to monitor the progress of this evolving tropical cyclone, especially next week,” Kottlowski said. Meanwhile, Texas and now southwestern Louisiana are still dealing with Tropical Storm Harvey. The weather disturbance has caused a great deal of destruction and cannot afford another storm such as Irma. Luckily, Irma’s models via the major weather agencies provided above show current trajectories missing the devastated region. We all know in weather forecasting just like stock market forecasting models tend to be wrong – just ask Dennis Gartman. RBOB is tumbling near $1.60 handle after headlines reported Valero saying that startup is underway at its Three Rivers refinery and its Corpus Christi refinery, both in Texas, according to a statement from co. spokeswoman Lillian Riojas. Blomberg reports that the company is working to ensure availability of critical transportation and logistics infrastructure to resume all operations. Houston and Texas City, Texas, facilities continue to operate. Port Arthur, Texas, refinery shut because of flooding and potential power supply interruption. Additionally, Plains resumed service on its Cactus crude pipeline after shutting it down Friday in preparation for Harvey, according to person familiar with matter. And, Buckeye expects to restore its 50k b/d condensate splitter to normal operations to at Corpus Christi, Texas, later Wednesday. Though we are unsure of why this would be bearish for crude (unless it is the crack spread arbs weighing it down). Early WEDNESDAY morning USA 10 year bond yield: 2.132% !!! UP 1 IN POINTS from TUESDAY night in basis points and it is trading JUST BELOW resistance at 2.27-2.32%. The 30 yr bond yield 2.738, UP 1 IN BASIS POINTS from TUESDAY night. USA dollar index early WEDNESDAY morning: 92.48 UP 23 CENT(S) from TUESDAY’s close. the Italian 10 yr bond yield is trading 50 points HIGHER than Spain. For today’s stock market recap, see yesterday! Treasury yields went absolutely nowhere today – trading in an incredibly narrow range! USDJPY (cough Kuroda cough) has just exploded since yesterday’s open…Someone was willing to pile in to every dip for 2 big figures straight up..
Trump finally breaks his silence on North Korea by stating that talking is not the answer and that the USA is through with giving North Korea bribe money. Following the latest missile launch from North Korea, which sparked panic as it flew over Japan before splashing down in the Pacific, Trump remained noticeably silent on the topic…until now. In a new tweet this morning, Trump has finally broken his silence saying “talking is not the answer!” to solve the North Korea crisis. As Bloomberg pointed out yesterday, the delayed Trump tweet on the topic was likely the result of a new process put in place by Chief of Staff Kelly to assure that responses to such crises go through formal White House channels rather than ‘off-the-cuff” tweets. Coming less than a week after Trump said Kim Jong Un was “starting to respect” the U.S., the test-firing was a provocation and required a clear response. So the team activated a process put in place by Trump’s new chief of staff John Kelly in anticipation of just such a crisis. The idea was to reach out first to reassure allies and ensure the initial response came not as an off-the-cuff presidential tweet but a statement that reflected measured thinking, according to people familiar with the process, who asked not to be identified discussing internal policy. Deliberations were cut off early in the evening as National Security Adviser H.R. McMaster — who was joined in his office by Tillerson for the calls on how to respond — prepared a statement for President Donald Trump’s approval, the people said. Meanwhile, stocks were at least momentarily ‘triggered’ by Trump’s tweet this morning even though we fully expect the “buy the dip” crowd to emerge any moment. Looks like the Armed forces are controlling things in the uSA. The market slumped briefly (the dip was quickly bought) after Trump appeared to be signaling that the administration was shifting tactics a day after a White House statement said “all options are on the table.” Mattis and Secretary of State Rex Tillerson have repeatedly said the top priority should be a diplomatic solution with North Korea. On Tuesday, U.S. Ambassador to the U.N. Nikki Haley called the test “absolutely unacceptable and irresponsible,” noting that North Korea has violated “every single security council resolutions have had” and suggesting a hard-line shift in US policy. As Reuters reports, Mattis made the comment during a media availability before the meeting, in which a reporter is allowed to ask a question on behalf of the press corps, which is then distributed to news outlets. Photographers and videographers are also allowed in. 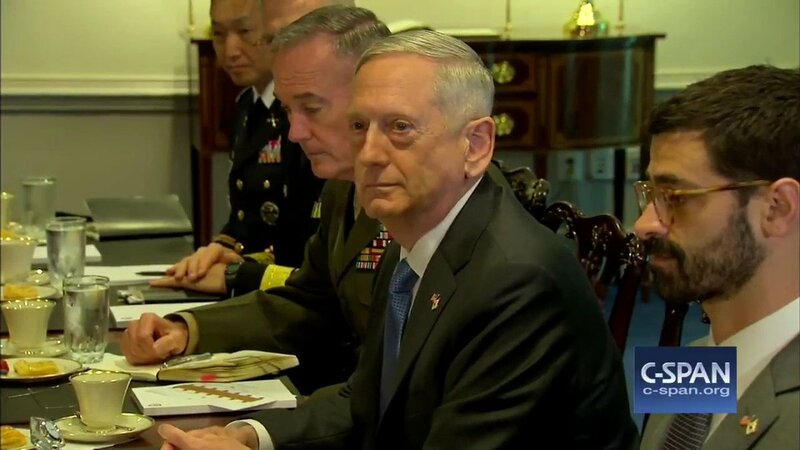 After initially saying “no” after being asked whether the U.S. was out of diplomatic solutions, the reporter pressed Mattis over what options can still be taken. A chemical plant in Crosby, Texas belonging to French industrial giant Arkema SA, has announced it is evacuating workers on Tuesday due to the risk of an explosion, after Tropical Storm Harvey knocked out power and flooding swamped its backup generators. The French company said the situation at the plant “has become serious” and said that it is working with the Department of Homeland Security and the State of Texas to set up a command post in a suitable location near our site. The plant, which produces explosive organic peroxides and ammonia, was hit by more than 40 inches of rain and has been heavily flooded, running without electricity since Sunday. The plant was closed since Friday but has had a skeleton staff of about a dozen in place. Following the flood surge, the plant’s back-up generators also failed. Our products are key ingredients in the manufacture of biodegradable herbicides, pesticides and animal feed supplements. These products are also used in the production of pharmaceuticals, photographic chemicals and circuit boards. Ethyl mercaptan is primarily used as an odorizer for propane gas. The strong odor that ethyl mercaptan adds to propane makes gas leaks easier to detect, protecting homes and businesses. MMP is used in the production of methionine, an essential amino acid and a key component of poultry, swine and ruminant (cattle, sheep, etc.) feed. The threat emerged once the company could no longer maintain refrigeration for chemicals located on site, which have to be stored at low temperatures. The plant lost refrigeration when backup generators were flooded and then workers transferred products from the warehouses into diesel-powered refrigerated containers. Just 6 hours later it admitted that the situations presents a risk after all. Meanwhile, Reuters adds that other chemical plants have also shuttered production in Texas because of the hurricane. These include Anglo-Swiss chemicals firm Ineos Group Holdings, which said it has been forced to shut down facilities in Texas. Chocolate Bayou Works and Battleground Manufacturing Complex, and INEOS Nitriles’ Green Lake facility are following hurricane procedures and are temporarily shut down, spokesman Charles Saunders said. Huntsman Corp said it has closed six chemical plants in Texas, along with its global headquarters and advanced technology center in Texas. Yesterday we reported, that in a potentially disastrous outcome from the Harvey flooding, a chemical plant in Crosby, Texas belonging to French industrial giant Arkema SA, has announced it is evacuating workers due to the risk of an explosion, after Tropical Storm Harvey knocked out power and flooding swamped its backup generators. The French company said the situation at the plant “has become serious” and said that it is working with the Department of Homeland Security and the State of Texas to set up a command post in a suitable location near our site. The plant, which produces explosive organic peroxides and ammonia, was hit by more than 40 inches of rain and has been heavily flooded, running without electricity since Sunday. The plant was closed since Friday but has had a skeleton staff of about a dozen in place. Following the flood surge, the plant’s back-up generators also failed. The threat emerged once the company could no longer maintain refrigeration for chemicals located on site, which have to be stored at low temperatures. The plant lost cooling when backup generators were flooded and then workers transferred products from the warehouses into diesel-powered refrigerated containers. One day later, and with the torrential rains finally over, has the situation at the giant peroxide chemical plant stabilized? Unfortunately, according to Reuters, the answer is no. Speaking to reporters on Wednesday afternoon, Richard Rowe, the chief executive of Arkema’s American operations said that “the company has no way of preventing chemicals from catching fire or exploding at its heavily flooded plant.” Rowe added that the company now expects chemicals on site to catch fire or explode within the next six days. Since the plant remains flooded by about six feet of water, “the company has no way to prevent” this worst-case outcome. Anticipating the worst, the company earlier evacuated all remaining workers, while Harris County ordered the evacuation of residents in a 1.5-mile radius of the plant that makes organic chemicals. Five days after it first plowed into southwest Texas as a category 4 hurricane, Tropical Storm Harvey has made second landfall west of Cameron on the border between Texas and Louisiana, early Wednesday according to the National Hurricane Center. The storm, which has already pummeled the city of Houston with more than 50 inches of rain – a new record for the contiguous US, according to the Wall Street Journal – has left at least 18 dead, including two Houston police officers, and forced tens of thousands of people from their homes. Though the hurricane (now tropical storm) has wreaked widespread devastation on Texas, Reuters says citizens of Western Louisiana have at least one silver lining to cling to: torrential rains are expected to cease later on Wednesday as the storm picks up speed and moves northeast away from the Gulf of Mexico. NOAA was forecasting less than an inch of rain for the Houston area on Wednesday, with a slight chance of sunshine. “Harvey, which made landfall west of Cameron, Louisiana on Wednesday, was expected to produce an additional 3 to 6 inches (7.5 to 15.24 cms) of rain to an area about 80 miles east of Houston as well as southwestern Louisiana, where some areas have already seen more than 17 inches of rain. It is projected to weaken as it moves inland to the northeast, the National Hurricane Center said. However, that’s hardly any consolation to residents of Houston and the surrounding Harris County, an area 15 times the size of Manhattan, one-third of which remains underwater, according to Reuters. It may take days for all flood waters, which have spilled over dams and pushed levees to their limits, to recede. According to WSJ, Texas officials said 30,000 people could be forced from their homes due to flooding and more than 725,000 people were under a mandatory evacuation order. A convention center equipped to hold 5,000 people was housing over 9,000 evacuees by midday Tuesday. Last night, Houston Mayor Sylvester Turner ordered a curfew from midnight to 5 am local time to prevent looting and keep the streets clear for first responders. CURFEW UPDATE: I’m modifying the curfew to start at midnight (and still end at 5 am) to allow volunteers and others to do their great work. One women who spoke to WSJ compared Harvey with a biblical flood. The Pentagon said Tuesday it has identified as many as 30,000 troops to assist in a massive military response, and was awaiting a formal request for assistance from Mr. Abbott, who has already activated 12,000 Texas national guardsmen to help with the state’s response to the hurricane. Federal and local agencies said they’ve already rescued more than 13,000 people from floodwaters in Houston and the surrounding area, according to ABC. More than four feet of rainfall has badly damaged Houston’s infrastructure, causing one bridge to collapse, as we reported yesterday. Two reservoirs in and around the city were already overflowing, and authorities warned that water levels at a third reservoir were nearing their top. According to Bloomberg, Harvey has created a situation where Gulf of Mexico waters have kept drumming hard up against the coastline, preventing rain water from running off into the sea and backing everything up for miles around. Predictions were that some areas east of Houston would witness 50 inches or more of rain by the time Harvey moved off into the central U.S. As of 3 a.m. local time Wednesday, the gauge at Mont Belvieu, east of the city, showed 51.88 inches had fallen since the start of the storm. That may be the most in recorded history for a tropical cyclone in the contiguous U.S., breaking a mark also set in Texas back in 1978. The record for all 50 states in such a storm was set in 1950 in Hawaii — 52 inches. Harvey’s deluge was made all the worse because the ground was already saturated by heavy rainfall earlier in the season. “We have had roughly a year’s worth of rain in the last three months,” said Wendy Wong, a National Weather Service meteorologist in Dickinson, Texas, a city that was evacuated. “We’re on the verge of having cascading failures,” said Watson, a Savannah, Georgia-based disaster modeler with Enki Research. “It is conceivable that we could get into the $60 to $80 billion range without that much effort.” Watson said disaster models just aren’t calibrated for a thing like Harvey. For instance, a typical scenario will assume infrastructure such as dams, levees and drainage systems will fail when stress rates reach 80 to 90 percent. “We are seeing failures at 60 percent,” he said. The pressure on the Addicks and Barker reservoirs west of Houston spurred the Army Corps of Engineers to release water, which flooded neighborhoods that had been dry before. Now such deliberate flooding should be more calculated, Watson said. “We’re starting to get into the apocalyptic — this is what we don’t want to have happen,” Watson said. While we wait for the apocalypse, Houston’s largest shelter, the George R. Brown Convention Center, held more than 9,000 people as of Wednesday, almost twice the number officials originally planned to house there. Mayor Turner said the city was working on opening two more shelters, adding that nobody would be turned away. Meanwhile, Texas Gov. Greg Abbott told ABC News’ “Good Morning America” on Monday that he expects the aftermath of Harvey to be “horrific” and that it will “take years” to rebuild. As reported last night, a nighttime curfew, from 10 p.m. to 5 a.m., was imposed in Houston Tuesday night as the storm’s center drifted back toward the Gulf of Mexico. The storm made landfall between Port Aransas and Port O’Connor in Texas on Friday, stalled out further inland over the weekend and is now trekking eastward. It is expected to reach the Lower Mississippi Valley by Thursday. Moody’s expects the storm to cause between $30 and $40 billion in property damage, which would make Harvey the fourth most severe hurricane to ever hit the US. Some have estimated as much as $100 billion in damages. As the storm leaves Texas and Louisiana behind late Wednesday, it’s expected to move across the Lower Mississippi Valley and Tennessee Valley through Thursday. The forecast calls for the storm to continue into the central U.S., and it’s expected to become a tropical depression by tonight. Even then, Houston won’t be free from threats: rainfall over the state will eventually need to make its way into the Gulf, which means several more pulses of water could be coming the city’s way, Watson said. “There is another train that is heading toward Houston,” Watson said. “Behind every one of these dollar signs is a family that doesn’t have a house anymore. Inevitably every major metropolitan crisis brings out the best and worst of what humanity has to offer. While hundreds/thousands of people have rushed into Houston following the epic destruction of Hurricane Harvey to help in any way possible, others have once again predictably chosen to exploit the misery of others by looting abandoned shopping centers, robbing empty homes and even breaking into the Houston Apple Store (by shooting through the front door). In fact, just last night Houston’s Mayor was forced to impose a strict midnight to 5am curfew amid “an outbreak of looting and armed robberies“, in order to prevent property crimes against evacuated homes in the city. As Reuters notes, the curfew came after, among other things, reports surfaced of people impersonating police officers all so they could tell residents to evacuate their homes and then promptly rob them blind. That proved too little for county officials who set up their own location as an outbreak of looting and armed robberies prompted the city to order an indefinite curfew from midnight to 5 a.m. (0500 to 1000 GMT). Houston Police Chief Art Acevedo said late Tuesday individuals impersonating police officers knocked on doors in at least two parts of the city telling residents to evacuate their homes. He said his officers arrested 14 alleged looters since Sunday. Those arrested will face stiffer punishments under a Texas law providing heftier penalties during a crisis, prosecutors announced Tuesday. “People displaced or harmed in this storm are not going to be easy prey,”Harris County District Attorney Kim Ogg said. Burglarizing a home would normally bring a penalty of two to 20 years in prison, but now brings five years to life. “This is the state of Texas. We are a welcoming city, but we are not going to tolerate people victimizing others,”Acevedo said. He said he will push for the fullest prosecution possible for any crimes committed during such a sensitive time.
.@ArtAcevedo: If you (criminals) take advantage of people in our community, we will prosecute you to the full extent of the law. Not surprisingly, some looters either did not get the message or have simply chosen to ignore it as pictures and videos of criminal activity continue to flood twitter. Update: Port of Corpus Christi update to port condition Modified Zulu for the Corpus Christi Inner Harbor. Coast Guard captain of the port in Corpus Christi implemented Port Condition Modified Zulu for the Port of Corpus Christi Inner Harbor. Modified Zulu allows tug and barges with drafts not exceeding 20-feet currently in the Corpus Christi Inner Harbor to transit freely within the Inner Harbor with no requirements to seek the COTP permission to move. “Mariners are to proceed with caution as navigational ads may be missing or off station. All other portions of the captain of the port zone remains in Port Condition Zulu unless they have already been cleared by the COTP,” the Coast Guard said. The U.S. Coast Guard along with the U.S. Army Corps of Engineers and the Texas General Land Office have provided an update on the current port conditions within the effected areas of Hurricane Harvey. Harvey, now a tropical storm, has resulted in significant flooding and impacts for ports along the Texas coast. “The Coast Guard along with the ASCOE and TGLO understand the international and global significance of the Gulf Coast ports and are currently conducting surveys and thorough port assessments prior to reopening,” the Coast Guard said in a statement Tuesday. If Texas was a sovereign country (2016), it would be the 10th largest economy in the world by GDP. The economic impact of Hurricane Harvey on port closures could be devastating not just for Texas, but perhaps 3Q17 GDP. Having in recent weeks boosted its estimate for government shutdown odds to even, or 50%, in a note overnight from Goldman’s Jan Hatzius, the Goldman chief economists writes that due to the human tragedy from Hurricane Harvey, the odds of a shutdown have been again reduced, back to Goldman’s original shutdown estimate of 33%. If they do, a combined package would be more likely to pass and less likely to be vetoed, in our view. As a result, the most obvious scenario now, and the one with the highest probability, is that disaster relief funding will be paired with legislation to raise the debt limit (due by September 29) and extend government spending authority (due by September 30), Goldman writes. That said, a shutdown or delayed debt ceiling hike is still clearly possible. Hatzius sees three ways that the current standoff could still end in a government shutdown. First, if the combined bill extends spending authority (and possibly the debt limit) for only a short period, a shutdown could still occur at the next expiration if the president insists on border wall funding. At that point, if hurricane relief funding has already been agreed to, a shutdown would have fewer negative political consequences and thus could become more likely. At this point, the continuing resolution (a short-term spending extension) is expected to last until mid-December, but could last anywhere from one week to several months. Despite these three potential hurdles, Goldman now believes there is a 35% chance of a partial federal shutdown “because it continues to be unlikely that Congress will pass legislation that funds the border wall and it continues to be unclear whether President Trump will sign spending legislation that omits it.” However, the odds of a presidential veto of upcoming spending legislation do appear to have declined somewhat following recent events and we therefore believe that a shutdown is less likely as a result. Then again, with Trump what typically appears obvious and makes the sense, usually ends up being the last thing to actually happen, so putting on the proverbial “hedging trades” may still not be a bad idea. ADP reports the US economy added 237,000 jobs in August, notably more than the expected 185k. This is the biggest addition since March, and follows upward revisions for July. While Services dominated (adding 204k), Goods-producing jobs rose 33k (with manufacturing adding 16k). Medium- and Large-seized firms added the most jobs in August. Manufacturing added 16,000 jobs in August…. While most components were revised higher in the latest release (with the notable exception of government which downshifted from 0.12% to -0.05%) the biggest contributor to the upward revision was Personal Spending, which surged 3.3% in Q2, after rising 1.9% in Q1, and contributing 2.28% of the bottom GDP line. As a result, the upward revision to the second estimate of GDP growth mainly reflected revisions to consumer spending on goods and to business investment. The full breakdown is shown below. Meanwhile, looking at the Fed’s preferred inflation indicator, the core PCE, it showed that for one more quarter inflation supposedly remained dormant, as core PCE rose 0.9% in 2Q, in line with expectations, after rising by 1.8% in the prior quarter. Today’s report also revealed that NIPA corporate profits increased 1.3% in Q2 after dropping 2.1% in the first quarter. Profits of domestic nonfinancial corporations increased 5.4% after increasing 0.3%. This however was offset by a sharp drop in profits of domestic financial corporations decreased 6.2% after decreasing 7.9%. Somewhat surprisingly, profits from the rest of the world decreased 2.0% after decreasing 2.1%, despite the steep drop in the USD. In total, the BEA reports that corporate profits increased 7.0 percent from the second quarter of 2016.